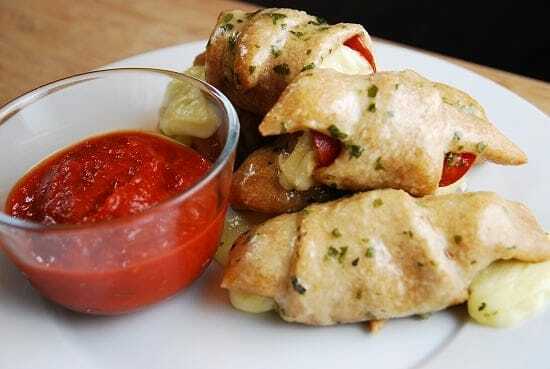 Substantial as a main dish recipe or an appetizer or snack, these tasty Pepperoni and Cheese Roll-Ups are nothing short of amazing. Pepperoni pizza is one of my favorite foods, but a slice from the local pizzeria is definitely not Weight Watchers friendly. By creating my own, unique twist on this popular American food, I was able to create a much healthier, low calorie version of pepperoni pizza, but for a lot less Points. 2 rolls are just 5 Points, so I can satisfy my pizza craving without breaking the bank. These are also easy to handle and eat, so they’d make perfect appetizers or snacks for game day and/or a Super Bowl party. They are cute, kid-friendly and easy to make. Definitely a hit at our household! I will be making these on a very regular basis. A pepperoni pizza lovers best friend, these roll-ups are a healthier and more Weight Watchers friendly alternative to pizza. Plus, they are a great idea for kids, or to use as a finger food to serve at parties. Preheat oven to 375. Line a baking sheet with parchment paper, and lightly mist with non-fat cooking spray. Lightly dust a flat surface with flour, and roll out pizza dough into a rectangle, about ¼” thick. Cut out 16 triangles, about 3” wide and 6” long. Place 3 slices of pepperoni on the bottom, wide end of each triangle. Place a cheese stick half on top of the pepperoni. Roll up, and place 2 in. apart on baking sheet, seam side down. Bake for 10-12 minutes or until golden brown. Let cool for 5 minutes. Meanwhile, in a small bowl, melt butter and stir in garlic powder and Italian seasoning. Brush each pepperoni cheese stick roll-up with the melted butter. Serve with marinara sauce or ranch dressing to dip. I’m not sure where to find whole wheat pizza dough… Is your 16oz package frozen? Where in your grocery store do you find it? In the cooler section? Get it from the bakery? I’ve seen the Pillsbury Artisan Pizza Crust “whole grain” – but I know that is not the same. I suppose it would work, but how many more points would it add? Other suggestions? Do you think these could be frozen before baking? There is only 2 of us, so if we could put half in the freezer that would be a great, quick weeknight meal. What type of pizza dough do you use? I have had some bad experiences with whole wheat pizza, but this looks like a great recipe for and upcoming party. Are you able to provide the sodium levels of your recipes like this one? Sounds great but I am on a low sodium diet so need to know sodium levels of everything I make.